The largest living parrot, now rare and expensive. Body deep blue-purple accented by yellow eye ring and bold yellow along mandible bottom. Greyish beak exceptionally strong, able to exert 135 kg of biting pressure per square inch. Female usually smaller. Hyacinth Macaw eats palm nuts, fruit and snails, also sunflower seed kernels, corn ears and fruit, occasionally a bone and cooked meat. Particularly strong cage or aviary; climbing tree if in house. Replace perches regularly. Do not keep on chain or ring. 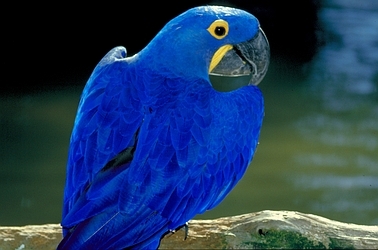 Hyacinth Macaws have a wingspan of 4 feet, so they must be given adequate time to exercise and room for a good stretch. It is a good idea to give a Hyacinth a minimum of 1-2 hours of time on a playgym or other safe area per day to maintain their muscles. Hyacinth's also need to chew to maintain their beak and jaws, so plenty of chewable toys are a must for these big beautiful birds. When screeches, circles overhead with tail streaming, then settles in treetops. Especially close pair bonding and tame with trusted people. Lays 2 to 3 eggs, incubation 28 days, fledging 100 to 120 days.